I will create individualized lessons to help you meet your goals. I can help with academic writing, grammar, vocabulary, and ESL. As a PhD student in Second Language Acquisition and Teaching, I bring my expertise to the field to make learning hands on and interactive for all ages, both in person and online. I'm dedicated to help you becoming bilingual or proficient for travel needs in another language. Bilingualism not only makes you smarter, as you have to learn to switch in between languages and inhibit one while using the other, it also makes you less likely to get Alzheimer's or dementia (New York Times, 2012). So what are you waiting for? Let's get you on your language learning journey today! Bon voyage! Buen viaje! Design curriculum and teach French to college students at University of Arizona (French 202). Co-lead and teach U of A's study abroad program in Paris (French 301, 302, 310, 320). French teacher at junior high and high school levels. French Instructor with an immersion approach for adult classes. Adjunct Professor of French Level 1. Started Flagler College's French program. 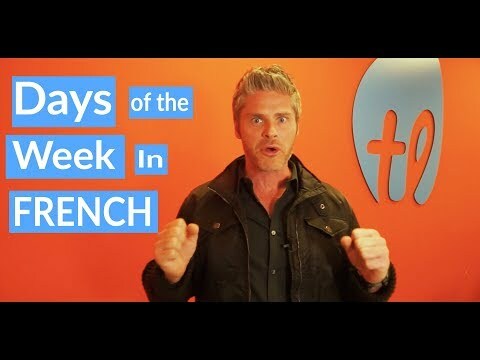 Clip of teaching French adjective agreement, pronunciation, and placement for Take Lessons. Featured in Take Lessons promotional video. When I'm not teaching, I love to travel and explore nature. 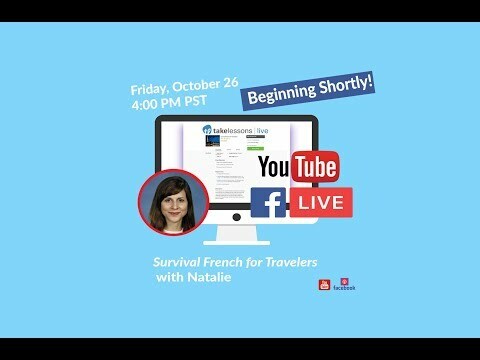 Survival French for Travelers. If you're interested in group classes (Take Lessons Live), this is what they are like! 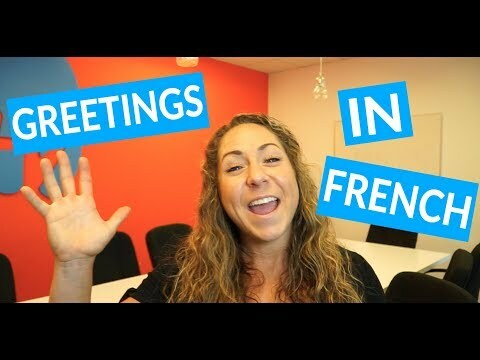 Teaching French greetings in a group class for Take Lessons Live. Excellent teacher. Natalie customizes lectures based on student need and which helped me a lot. Natalie is truly a gifted teacher. My son (13) was struggling in French, and is now among the top in his class. Natalie always has a lesson planned and her materials are great resources for my son to review. Having this one-on-one lesson has made a tremendous difference for my son, and he has gained so much confidence in his French studies. Natalie also lets me know how the lesson went. I'm very grateful we found Natalie! Very good instructor; tackles the hard stuff. good lesson for a beginner ! Natalie is really a good teacher; patient but challenging. Fills the lesson to the last minute with information. Natalie is such a good instructure. After not having class for 2 weeks due to holiday and other events, it was easy to catch up . Natalie is a patient instructor. Natalie is one of takelessons' best teachers. She is very resourceful and dedicated. Besides her remarkable knowledge, she has excellent people skills to guide you through your learning process. Totally recommend her as your instructor! Natalie really packs the lesson with lots of practice options. Good intro lessson; looking forward to the next one. She is punctual, well-prepared, efficient during lessons (she writes points and comments online so I can review after class), flexible, supportive, and fun teacher. I highly recommend her lessons!! My first class was great! Natalie is a very good at what she does and understands very well my goals. Well prepared lessons. Good insights. I have been learning French with Natalie for a month and a half already and I am very grateful for her knowledge, kindness, flexibility and excellent teaching skills. Her private and group lessons are prepared and organized with objectives, explanations, examples, links to external materials and homework so you can study on your own. She makes her classes super fun and interesting, I learn a lot. Besides my weekly private class with Natalie, I take several group classes with her and other teachers... Natalie is my favorite, I highly recommend her!! Natalie is a fantastic Spanish teacher! She comes to every lesson well-prepared and enthusiastic about teaching. I've taken 5 classes with her and already learned so much. I highly recommend taking Spanish with Natalie! Very organized and information packed lesson. Great experience. Natalie is very good at getting the best out of her student. Natalie is an amazing teacher! My son (12) was really struggling in French, but since working with Natalie he's doing so much better and feels much more confident in his studies. She is very organized with her lesson plans, keeps me posted on how he's doing, and my son really enjoys working with her. We're very fortunate to be working with her. Natalie is a very precise teacher and funny one too. She is always very calm. The lessons I took in Spanish are amazing. Not only I learn Spanish but I also have fun. Very Efficient class. Natalie is well-prepared by showing up on time and utilized every minute in the 30-minute class. Natalie worked with me to improve my score on the TOELF test, and I did. My grade went from 23 to 29 (almost perfect ) on the listening part. I improved a lot on the speaking part of the test. All of this was done in just two months. My speaking skills have improved a lot and people don't ask me twice what i am saying. Natalie has been very professional.She always prepares the classes on advance. I always get my topics before the class begins. Now we are working on my writing skills, so i can be ready for graduate school. I recommend Natalie very much. Natalie is very fluent, patient, and upbeat when conducting our lessons. She is also well organized and prepared. Although this is difficult, she is making the learning experience very pleasant. She is an excellent teacher , I like the lessons with her. Great energy, very prepared and super responsive!!! Highly recommended! I like her a lot!!!!!!!!!!!!!!!!!!!!!!!!!!!!! She just did better than ever!Did she practice? She is such a good teacher! She is so nice, she tries so hard to make things fun! I recommend this teacher. This is the best instructor ever she is funny, nice,and great at making you learn spanish. Excellent teacher. Well prepared, great memory, makes the class personal, listens to what you want/need. Patient. All around great! Excellent teacher! Prepared and professional! Looking forward to more classes with her! Nataly was very helpful in our first session. She took the time and prepared the class so we she could design the rest of the classes. She also was very patient and and very professional. Natalie was a major motivator in my choice to continue studying French. I stumbled upon her when my confidence in my abilities were low. Thanks to Natalie I am continuing my pursuit in the mastery of the language. She loves what she does and she does it with immense passion. Very helpful teacher who helped me re-learn French after many years of being away from it. She was very patient and fit lessons to my specific needs with creative solutions. She has my highest recommendation. Natalie is an outstanding instructor! She is engaging and makes learning enjoyable. She goes above and beyond to make sure that her students learn the material and is incredibly patient and understanding when students have difficulties and challenges. She also uses authentic material and strives to make classes interesting and relevant to the students. She has a strong command in her subject areas and she demonstrates this in her teaching style at all times. She is professional, but also personable and easy to connect with. Highly recommended! Natalie is a great teacher who not only teach the knowledge but also inspires students' interested in learning language. I was honored to be her students and proud of her. Under her instruction, I made a great improvement in listening and speaking English, which helps me a lot in my graduate program. I very appreciate her inspiration and teaching. Natalie was an awesome spanish tutor! I learned so much from her during our sessions. She teaches in a way that makes it easy to understand. With her help I was able to do exceptionally well, and I passed my spanish course! She is the best instructor I have met. She is an excellent teacher for accent reduction and linguistics.